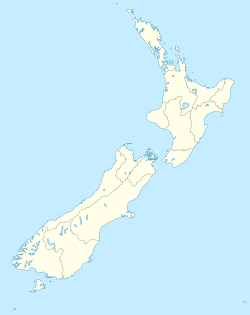 For names related to Matamata, see Matamata, New Zealand (disambiguation). For the settlement in Brunei, see Mata-Mata, Brunei. For other uses, see Matamata (disambiguation) and Matmata (disambiguation). Matamata [ˈmataˌmata] is a town in the Waikato Region of New Zealand's North Island. It is located near the base of the Kaimai Ranges, and is a thriving farming area known for Thoroughbred horse breeding and training pursuits. It is part of the Matamata-Piako District, which takes in the surrounding rural areas as well as Morrinsville and Te Aroha. State Highway 27 and the Kinleith Branch railway run through the town. The town has a population of 7,920 as of June 2018. A nearby farm was the location for the Hobbiton Movie Set in Peter Jackson's The Lord of the Rings. The New Zealand government decided to leave the Hobbit holes built on location as tourist attractions, since they were designed to blend seamlessly into the environment. During the interim period filming The Lord of the Rings: The Return of the King and The Hobbit: An Unexpected Journey they had no furniture or props, but could be entered with vistas of the farm viewed from inside them. A "Welcome to Hobbiton" sign has been placed on the main road. In 2011 parts of Hobbiton began to close in preparation for the three new movies based on the first Tolkien novel, The Hobbit. Peria, on the outskirts of Matamata, was the scene of the Kīngitanga meeting of 1863. Matamata was a station on the Kinleith Branch, from 8 March 1886, initially 40 minutes north of the temporary terminus at Oxford and about an hour from Morrinsville. It was 6.03 km (3.75 mi) south of Waharoa, 7.91 km (4.92 mi) north of Hinuera and for a while seems to have become a flag station, though it did have a goods shed. It had 2 members of staff from 1913 and by 1950 8,868 tickets were sold at Matamata and it transported 42,322 sheep and pigs. It closed to passengers on 12 November 1968, but reopened to serve the Geyserland Express from 9 December 1991 until 7 October 2001. The station building was replaced in the 1960s and has been the Railside by the Green community centre since 2002, though it is fenced off from the platform. Occasional excursions still use the platform. Matamata is the home of various media outlets, including studios for tvCentral, TV Rotorua and iTV Live, which is unusual for a town of such size. Matamata is home to the Matamata Swifts soccer team, who compete in the Lotto Sport Italia NRFL Division 1A. ^ "Matamata Area Guide". Retrieved 7 January 2009. ^ "Maori Report Of The Speeches At The Meeting At Peria". Press. 3 January 1863. p. 3. Retrieved 20 June 2016. ^ a b "Matamata railway station with the Plantation behind (pre-1919)". Retrieved 31 May 2018. ^ "Matamata-Piako District Plan". www.mpdc.govt.nz. Retrieved 31 May 2018. ^ a b Scoble, Juliet (2010). "Names & Opening & Closing Dates of Railway Stations" (PDF). Rail Heritage Trust of New Zealand. ^ "Page 7 Advertisements Column 4". Te Aroha News. 29 May 1886. p. 7. Retrieved 31 May 2018. ^ Yonge, John Roger; Company, Quail Map (1993). New Zealand Railway and Tramway Atlas. Quail Map Company. ISBN 9780900609923. ^ "Matamata". nzetc.victoria.ac.nz. 1902. Retrieved 31 May 2018. ^ Representatives, New Zealand Parliament House of (1908). Parliamentary Debates. ^ "Railway Station Matamata, showing two steam locomotive trains stopped". www.aucklandcity.govt.nz. Retrieved 31 May 2018. ^ "Parliamentary Papers | Appendix to the Journals of the House of Representatives | 1913 Session I". paperspast.natlib.govt.nz. Retrieved 31 May 2018. ^ "Parliamentary Papers | Appendix to the Journals of the House of Representatives | 1950 Session I". paperspast.natlib.govt.nz. Retrieved 31 May 2018. ^ "Inter-regional Rail service distances and times". www.bettertransport.org.nz. Retrieved 31 May 2018. ^ Miller, Frederic P.; Vandome, Agnes F.; John, McBrewster (14 December 2010). Geyserland Express. VDM Publishing. ISBN 9786134003926. ^ "home". www.railsidematamata.co.nz. Retrieved 31 May 2018. ^ "Matamata: New Zealand's re-cycled Station". Phillip Overton. 13 December 2013. Retrieved 31 May 2018. ^ "Photos – Silver Fern to Matamata". nzrailphotos.co.nz. Retrieved 31 May 2018. ^ "Glenbrook to Matamata & Return – Waikato Explorer – RES Excursions – Glenbrook Vintage Railway". www.gvr.co.nz. Retrieved 31 May 2018.